The late Gary Collins and the late Mary Ann Mobley, who passed away in 2012 and 2014 respectively, are pictured with UM Chancellor Emeritus Robert Khayat at a university-hosted gala in Washington, D.C. The couple were extremely loyal to Mobley’s alma mater and home state, always answering the call to support initiatives and help with needs. 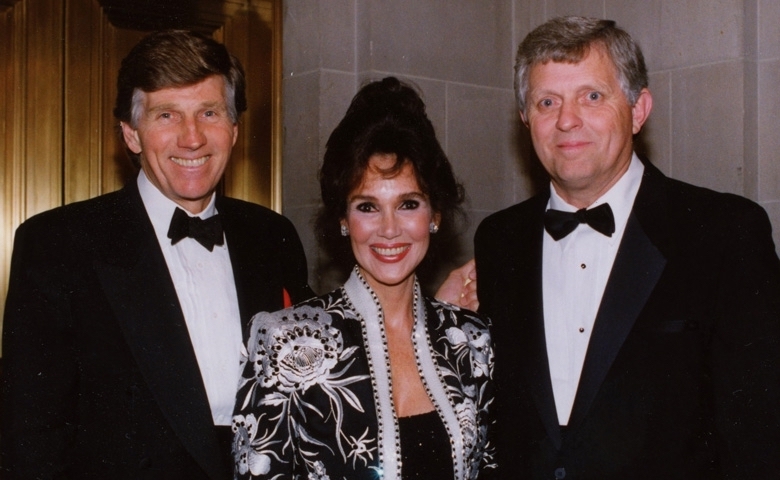 The first Mississippian to wear the Miss America crown, the late actress Mary Ann Mobley, and her husband, the late actor Gary Collins, will have their legacies expanded at the University of Mississippi with the naming of a studio theatre in the Gertrude C. Ford Center for the Performing Arts and the university’s first-ever theatre and film scholarships. Their daughter, Clancy Collins White, of Los Angeles, has directed more than $1.6 million from Mobley’s estate to her alma mater, where she was the inaugural recipient of the prestigious Carrier Scholarship, an Associated State Body officer, majorette in the band, Miss Ole Miss and Miss University. A public ceremony is set for 6 p.m. Friday (Oct. 27) in the Ford Center lobby, paying tribute to the lives of the couple, as well as honoring White for her role in the gift. Before the dedication, a reception begins at 5:30 p.m., with the couple’s photos and scrapbooks on display. Theatre arts students also will perform several musical selections following the dedication. “At a time when our world is in such disarray and all we’ve held dear seems to be in jeopardy, there is such an incredible power in storytelling – the power to inform, educate and most importantly transform,” she said. “My parents were huge believers in the power of the arts to impact people’s lives and make them feel. And they felt as though performing is the greatest expression of love. Chancellor Jeffrey Vitter expressed his appreciation for the significant gift. “We are deeply grateful to Clancy Collins White for directing this marvelous gift to the University of Mississippi, enhancing our vibrant cultural arts offerings,” Vitter said. “To have Mary Ann Mobley’s and Gary Collins’ names on the studio theatre and scholarships makes us very proud; they were both such loyal, passionate ambassadors. The gift reflects the family’s love for Ole Miss, Mississippi and the importance of the arts in everyone’s lives, said Julia Aubrey, Ford Center director. Recognized humanitarians, Mobley and Collins also supported “Mississippi Rising,” the Hurricane Katrina benefit hosted at Tad Smith Coliseum in 2005, as well as countless other events and initiatives designed to build resources for Ole Miss and the state. “Mary Ann Mobley never forgot her home state as she pursued a career in Hollywood, and Gary Collins adopted Mississippi as his home state,” Aubrey said. “Throughout their lives they gave back to Mary Ann’s alma mater and supported efforts to celebrate the arts and bring attention to the needs of the people of this state. The 130-seat Mary Ann Mobley Collins and Gary E. Collins Studio Theatre will be dedicated inside the Ford Center, which will benefit from half the gift. The Mary Ann Mobley Collins Theatre Arts Scholars – the first endowed scholarships in the department’s history – will assist students who want to pursue careers in the performing arts. The scholarship resources will have a significant impact on students, said Michael Barnett, chair of the Department of Theatre and Film. “This assistance will enable students who are chosen as recipients to focus on their education so they can entertain and enrich audiences around the world,” he said. “They will be able to fully dedicate themselves to their craft. Mississippians gathered around their TV sets on Sept. 6, 1958, to watch with pride as their native daughter won Miss America 1959. Mobley, a native of Biloxi who later lived in Brandon, went on to achieve success in film, television, Broadway, personal appearances and as a documentary filmmaker. Chancellor Emeritus Robert Khayat was a lifelong friend of Mobley’s, beginning with their freshmen and sophomore years at Ole Miss. “Mary Ann became Mississippi’s most popular citizen, before Archie and Eli Manning,” Khayat said. “After she brought such positive attention to her home state, no child was raised in Mississippi without knowing who Mary Ann Mobley was. Mobley was the first woman to be voted into the Ole Miss Alumni Hall of Fame. The group inducted with her included her friend William Faulkner, the Pulitzer- and Nobel Prize-winning author. White agrees with that description of her father, a native of Venice, California, who made his motion picture debut in “Cleopatra,” starring Elizabeth Taylor and Richard Burton. He acted in a number of movies, Broadway productions and TV series. He also was host of “The Home Show” and “Hour Magazine,” for which he won an Emmy. Additionally, he hosted the Miss America Pageant from 1989 to 1994. “My parents were married in Mississippi in 1967 and from then on, my father’s love for Mississippi only grew and grew,” White said. “By the time I was a child, I think he loved it as much, if not more, than mom! In fact, that was part of the inspiration behind the gift. Mobley and Collins were active volunteers with the March of Dimes for more than three decades and traveled around the globe with relief organizations to end world hunger. They were involved with the Crohns & Colitis Foundation and other groups. Collins was dedicated to raising awareness about breast cancer in support of his wife, who was diagnosed with cancer twice. Sam Haskell III – a philanthropist, author, producer and the former Worldwide Head of Television at the William Morris Agency – and his wife, actress and singer Mary Donnelly Haskell, were close friends of Mobley and Collins. Both couples lived in Los Angeles and were enthusiastic ambassadors for Ole Miss and Mississippi. Mobley and Collins appeared in every show Sam Haskell produced to secure funding for student scholarships, academic programs and disaster relief. “As I think of the careers of many, and I was involved in so many, I think about Mary Ann Mobley and Gary Collins and the amount of national and international exposure they had,” Haskell said. “I’ve always believed the best way to make a difference is to use whatever position God has blessed you with to do that. To make a gift to the University of Mississippi, click here or, for more information, contact Charlotte Parks at 662-915-3120 or cpparks@olemiss.edu.